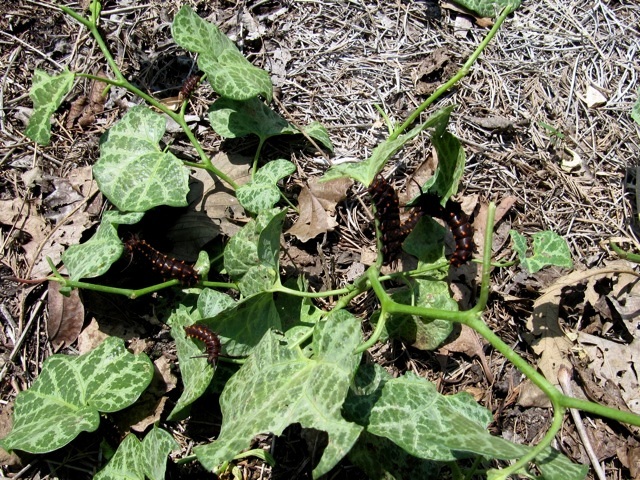 Aristolochia tomentosa and other related species of Dutchman's Pipe Vine are host plants for the Pipe-vine or Blue Swallowtail butterfly that lays it's eggs on the leaves, where the larvae hatch and feed together on leaf edges. The pipe vine flower attracts and traps flies and gnats. This vine has attractive large heart shaped leaves, interesting flowers and seed pods. Seed pods are up to 3" long and 1.5" wide. Flowers are 1 to 2 inches long and shaped like a pipe. Dutchman's Pipe Vine grows well from seed and is easily grown in average, medium wet, well-drained soil in full sun to part shade. It prefers rich, moist soils and is intolerant of dry soils. It can be cut back in late winter to control growth. It is a woody, deciduous, twining vine typically found growing along streams and in moist woods rapidly to 20-30' tall. Dutchman's Pipe vine has large, heart-shaped, densely-overlapping leaves (4-8" long) which can quickly cover an arbor or trellis with deep green foliage. The common name Dutchman's pipe comes from the unusual, 2" long, yellowish-green, curved-trumpet flowers (each flaring at the calyx mouth to form three brownish-purple lobes) that superficially resemble Dutch smoking pipes. It blooms in mid to late spring and grows large, ribbed, tubular seed capsules (to 3" long) which mature to a grayish-brown in September. Aristolochia spp. is a larval food plant for the pipe vine swallowtail butterfly. Dutchman's Pipe Vine provides dense cover for sun porches, verandas, pillars, posts, trellises, arbors, fences or walls. It has been used to screen front porches and is a good selection for the butterfly garden. Dutchman's Pipe Vine grows wild in low woodlands from Florida to East Texas and North to North Carolina, West to Southern Illinois, Missouri and South-eastern Kansas. but it can be planted and will grow over a wider area. USDA plant hardiness zones 4 to 8.